Duck Dynasty’s Phil Robertson is probably one of the strangest people on reality television. When you think of reality stars, Kim Kardashian is probably the first person that pops up in your head, not Mr. Dynasty, correct? With the ratings for his show rising, so is his love with his wife, Miss Kay, who he married when she was just sixteen years old… and he hasn’t looked back since. Okay, so if you’re a woman, like seeing animals being killed, skinned and eaten, don’t have a problem cooking them and feeding them to your children and to your husband, then you’re in the safe zone so far. Oh, and not to forget, you have to be quite religious to have a chance with someone like Phil. Ha. “Get someone who is meek, gentle, kind-spirited …a country girl that loves to eat bullfrogs – now there’s a woman. Don’t get no yuppie girl,” the 66-year old added. Okay, enough of that romance talk. 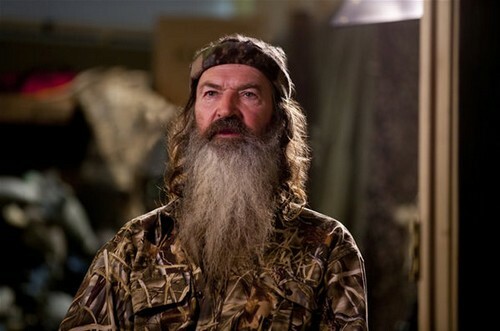 Let’s focus on the amazing ratings his show, Duck Dynasty, has had in the last few weeks. Its premiere date for the third season saw 8.6 million viewers tune in… that’s DOUBLE of what the show got on the premiere of the second season! As gross as he may be, he knows how to keep viewers entertained.